This R2D2 costume was so much fun to make. My oldest son was Darth Vader and my youngest son was Yoda, so keeping with the Star Wars theme I had to come up with a character for my middle son. I kept searching for something to catch my eye, but none of the store costumes were cute for a 3 year old. So, we decided to make an R2D2 costume. We started with just white poster board for the cylinder. I stapled elastic for the shoulder straps. Then we just drew most of the details and added a little felt here and there for buttons. For the hat, I took an old white mixing bowl. Then I glued grey felt all over the outside. I purchased some blue duct tape from a local craft store and cut out the blue squares. In addition, I also taped the edge of the bowl with the blue tape. For the eye, I used half Styrofoam ball painted black. We just taped the R2-D2 helmet to his bicycle helmet when we went trick or treating. For the legs we just used some Styrofoam packing, cut it into two pieces, and attached with wire. I hope you enjoy the picture! 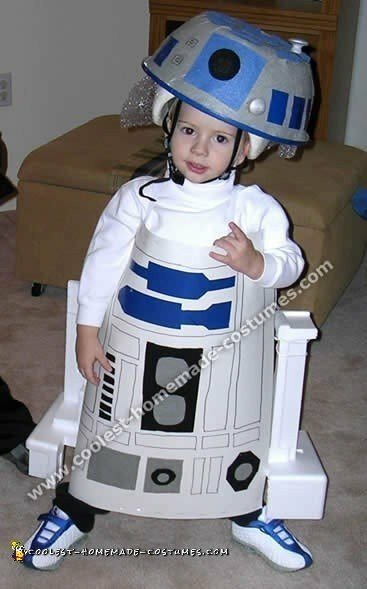 If you love looking for costume inspiration, you must check out more cool Star Wars droid costumes on this site. For instance, these awesome R2D2 and BB8 kids!